5Sendai Tomisawa Hospital, Sendai , Ja pan. Received 23 March 2011; revised 8 May 2011; accepted 20 July 2011.
food, times watching TV and playing games. 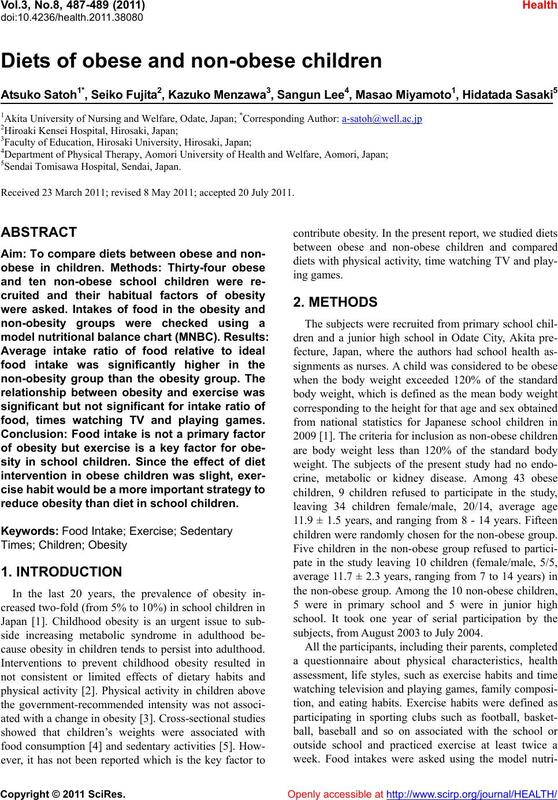 reduce obesity than diet in school children. cause obesity in children tends to persist into adulthood. children were randomly chosen for the non-obese group. subjects, from August 2003 to July 2004. Mann-Whitney’s U test was used for the significance. the variations. Values were presented as mean ± SD. Statistical significance was considered for p < 0.05.
group and 8 and 2 in the non-obesity group, resp ectively. in non-obese children than obese children (p < 0.01). 500.9, p < 0.05) and not significant for other factors. tor in determining obesity, there may be other factors. Table 1. 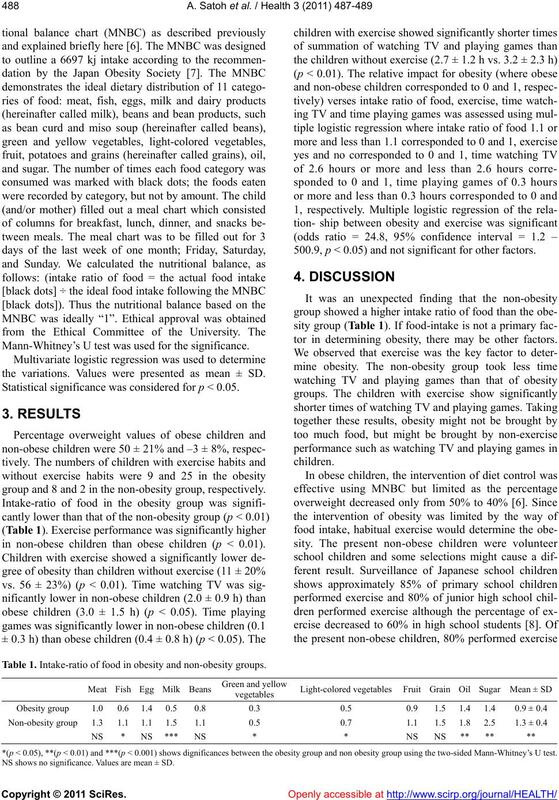 Intake-ratio of food in obesity and non-obesity groups. *(p < 0.05), **(p < 0.01) and ***(p < 0.001) shows dignificances between the obesity group and non obesity group using the two-sided Mann-Whitney’s U test. NS shows no significance. Values are mean ± SD. which seems to be an average percentage for exercise. ing Department of the Ministry of Finance, Tokyo. and their families using a model nutritional balance chart. 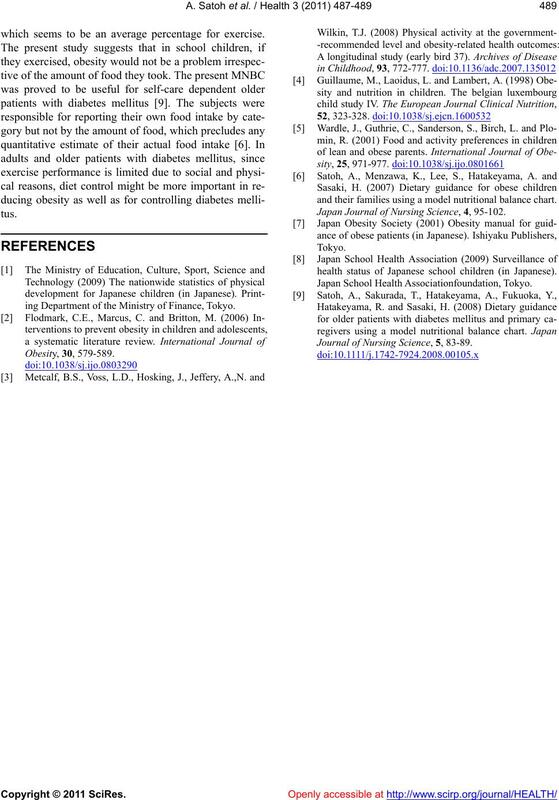 Japan Journal of Nursing Science, 4, 95-102.
health status of Japanese school children (in Japanese). Japan School Health Associationfoundation, Tokyo. Journal of Nursing Science, 5, 83-89.